Sitting in the backyard of his Danbury, Connecticut home just a few days prior to departing for Hamburg, Germany, Glover Teixeira is as content as can be. Another training camp in the books, the warm summer afternoon is spent in the company of the characters in the book he’s reading and the birds that flit and sing as he flips the pages and soaks up the sun. 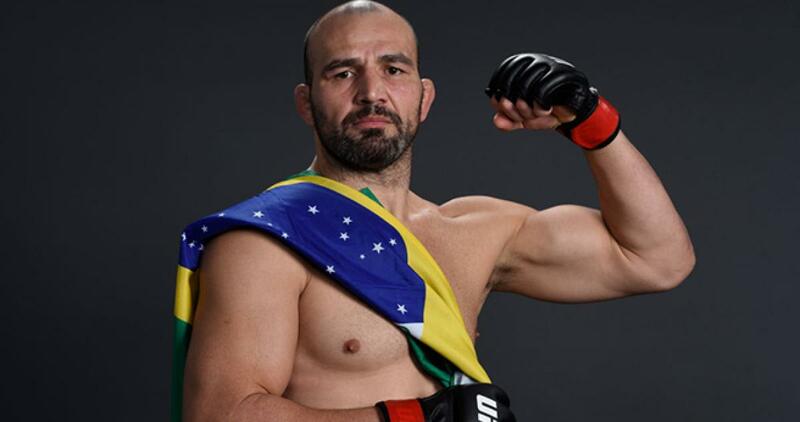 “I told my wife a few years ago that I was looking for different things to do eventually because I could start planning my retirement,” says the 38-year-old Brazilian, who squares off with Corey Anderson in the co-main event of this weekend’s fight card at Barclaycard Arena. “But right now, I’m feeling great and I want to keep fighting for a little bit. “You’ve just got to say smart, stay healthy and don’t look down on anyone because anything can happen. Don’t take anything for granted, keep working hard and enjoy. From a competitive standpoint, there is no reason for Teixeira to walk away. Despite being one of the elder statesmen on the roster, the veteran finisher remains a fixture in the Top 5 in the light heavyweight division, a position he’s maintained for the majority of his time competing in the Octagon. Tabbed as an immediate contender when he arrived in the UFC just over six years ago, Teixeira quickly lived up to his advanced billing, extending his winning streak to 17 with stoppage wins over Kyle Kingsbury and Fabio Maldonado in his freshman and sophomore appearances in the eight-sided cage before routing Quinton “Rampage” Jackson in his third fight to climb into the upper echelon in the 205-pound weight class. While he’s suffered a handful of defeats inside the Octagon, Teixeira has only ever been beaten by the cream of the crop in the division – champions and title challengers – which both bolsters his confidence and gives him a goal to work towards at the same time. He’s also motivated by the performance of the man everyone in the division is chasing at the moment. “As soon as I got in the UFC, I was Top 5 in two, three fights and I never came out of there,” he says. “I lost a couple tough fights that I had, but no excuses. I had to figure it out. I have to change what I have to change in order to be the best. I’ve only lost to the No. 1 and No. 2 fighters, the top, top contenders. “I’ve got to figure out the way to be champion, to beat those guys, but I’m doing something right because I’ve been in the Top 5 for a very long time and I hope to stay there for a little while. Not that he’s lacking for motivation either. A professional for well over a decade, Sunday’s appearance opposite Anderson will be the 34th fight of Teixeira’s career, and while he’s logged plenty of rounds inside the cage and routinely put his body though intense training sessions for more than a dozen years, the Brazilian has been relatively healthy throughout his career. He’s only had to go under the knife once – to repair a broken hand suffered in his loss to Alexander Gustafsson last year – and continues to take the necessary steps to maintain his health and help extend his career even further. Plus, he’s as passionate about competing and in love with fighting today as he was when he started. “I know I’m 38 years old and I don’t have too many years (left), but I’m going to keep trying,” laughs Teixeira. “I’m very smart with my body, the way I train. I train all the time and I’m always doing conditioning, so hopefully I can last longer than the average fighter. “I’ve got to change my lifestyle and I’m doing it slowly – eating better, enjoying things in a different way – and I feel like I’m in a good place right now. I’m happy with the camp, I love fighting and I want to keep doing it. And at the end of the day, isn’t that all that really matters?